Welcome to the cultural diversity portion of our website. Over the years, we've traveled and lived abroad. Read some of our stories from Cuba, Peru, and India. In the process, we met many different people. We've been fascinated by the differences in the way that they view the world, the things they value, the ways they communicate, and a myriad of other ways in which their lives differ from ours. We've celebrated different traditions, learned new greetings, and striven to understand unspoken nuances of communication. Our experiences have forced us to examine our own values, introduced us to new ones, and on the whole shaped us unto more diverse individuals. We've had enjoyable experiences, sobering experiences, embarrassing ones, and occasionally, we've been downright offensive--not on purpose--but simply because we didn't understand the culture of our hosts. For example, read about when Terry asked for an ice cold coke or when Ann ordered ice cream. Do you have a cross cultural story? Scroll to the bottom of the page and share it with us. Then read the stories of other visitors. St. Basil's Cathedral on Red square, Moscow, Russia. Merriam Webster explain culture this way "the customary beliefs, social forms, and material traits of a racial, religious, or social group." Culture is an all encompassing word, it includes beliefs about what is right and wrong, customs about proper manners, ways of interacting with others. It dictates habits of when and what to eat, how to dress, how to drive, how to act in public, and just about every aspect of daily life. Owen Lee provides an excellent summary of all of the aspects of culture. It is entitled Beyond Languages and is a free download when you buy Ultimate Language Secrets. We recommend it. Culture can be reflected visually in forms of art and architecture. 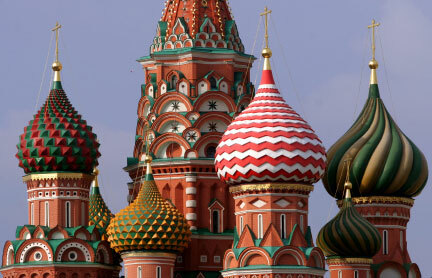 The brightly colored cathedral above is characteristic of Russian architecture. Traditional clothing tells us something about the lifestyle of our hosts. Traditional Indian women wear sarees while the bush women of the Solomon Islands wear grass skirts and seashell necklaces. We hear it in the music and environmental noise from a country. The wailing notes of music or the call to prayer of the muezzin tells me I'm in Palestine. We smell and taste it through the traditional foods of each new country we visit. Thinking of pizza made fresh in a Napolitano brick oven or pasta al forno in the kitchen of an Italian housewife makes my stomach yearn with homesickness. We fall in love with some of these external manifestations of culture, and so we bring back recipes, artwork, CD's, and clothing so that we can remember the culture that we visited. On one of my trips, I took a portable tape player to record sounds that I heard along the way. One of the most memorable sounds on that trip was the ship's horn on the ferry from Calais, France to Dover, England. It was so powerful that it seemed to resonate inside me.While the external expression of culture is fascinating and usually easy to experience. The internal component of culture is much harder to put one's finger on. For example, the United States of America is a melting pot of cultures and peoples. We pride ourselves on the fact that over the centuries, we've welcomed people from all nations. This mix of cultures gives character to the landscape of the USA. Because of this, the question "Where are you from?" is often one of the first questions an American will ask a stranger. A person with an accent is particularly likely to be asked this question. In Sweden, by contrast, it is bad manners to ask a person where they are from. A Swede would never dream of asking a stranger such an intrusive question. A number of years ago, my friend Maria was traveling on the train through Denmark. She was on her way home to Sweden. Although, she speaks English well, she feels awkward doing so. While traveling, she struck up a conversation with the man sitting next to her. They conversed in English for several hours as the train sped through Denmark. As they approached the boarder and prepared to pass through customs, both of them pulled out their passports, only to discover that they were both Swedish citizens. Because it is bad manners to ask a person where they are from, neither had questioned the other and they had spent hours talking in English because of their common Swedish culture. They both chuckled when they realized their common nationality. This example illustrates how culture governs the way we act, even in something as simple as meeting a stranger. Getting around in different cultures can be full of pitfalls. Read about fika, another example that helps define culture. Quite often the clash that occurs when a person is immersed in a new culture can be unnerving. When you're moving overseas, you come face to face with the realities of cultural diversity; it can be stressful; click here to learn more about culture shock. Planning to study abroad? Having a hard time choosing a program? Check out our helpful guide "How to Choose an International Study Abroad Program." Best of all, it's a FREE download. One of my favorite places in the world is Italy. I spent a year and a half there. I loved the people, the food, the culture, and especially the Italian language. I had some great experiences in Rome. I loved the way that Italians speak with their hands and the way they get so passionate about their opinions, especially on the bus. I spent a year as an exchange student in Sweden. I learned ton about myself, about Sweden, and about how to navigate the challenges and excitements of living abroad. I share my study abroad tips here. As a family, we lived in the Solomon Islands. We had many one-of-a-kind experiences. Read about our visit to the Kwaio, Terry's return to the Solomon Islands, or two short fictional stories set in the Solomons. My friend Trinidad at Study Spanish Latin America has a whole section with Latin American country profiles. They also offer Spanish language schools with Spanish immersion and Spanish lessons. The best way to learn a language is by visiting the country. What is your cross cultural story? Our readers have traveled the world and have great stories to share. Help others prepare for cultural differences in the countries that they want to visit. Share your best examples of cultural diversity. A picture tells a thousand words. Illustrate your story with a few pictures or graphics. Click the button and find the first one on your computer. Select it and click on the button to choose it.